Entering Yayoi Kusama’s “A Dream I Dreamed” exhibition in Kaohsiung. Image via udn.com. Yayoi Kusama “A Dream I Dreamed” comes to Taiwan’s Kaohsiung Museum of Fine Arts. The Japanese art star’s touring retrospective “A Dream I Dreamed” opened in Taiwan’s southwestern city of Kaohsiung on February 7. The exhibition features more than 100 pieces, including paintings, sculptures, installations, and documentary film footage. 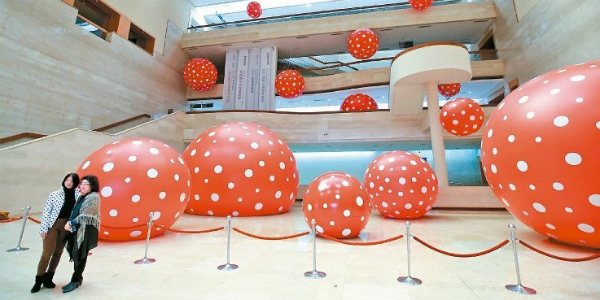 A new version of her large polka-dot balloons installation has also been especially created for Taiwan. “Dots Obsession 2015″ uses gigantic red and white polka-dot balloons to fill a hall from floor to ceiling, enveloping the viewer in Kusama’s patterned vision. Also on display is the much anticipated “Infinity Mirrored Room”, an installation of a mirrored room full of lights that create a kaleidoscopic illusion of infinite shimmering space. Following the huge success of its South American version which was overwhelmed by fans in Mexico, Taiwan’s hospitality industry is hoping to cash in, offering discount packages for accommodation, tickets to the art show, as well as souvenirs for NT $3,500 (about $100). Kusama’s show will only visit Kaohsiung and then travel to Taichung in June. “A Dream I Dreamed” will be on view at Kaohsiung Museum of Fine Arts, Kaohsiung, Taiwan, from February 7 through May 17, 2015.
via Will Yayoi Kusama Retrospective Bring More Record Crowds to Taiwan’s Kaohsiung Museum of Fine Arts? on artnet News.